Quarterbacks and tight ends were responsible for some huge games this past week. Some of the players involved were on rosters in most leagues like Brees and Manning. The ones that are still available are the players to focus on at this point. After checking out the bye week teams, we’ll forge ahead and see what signal callers and tight ends should be picked up before week 9 begins. Winston has been a fairly reliable starting option throughout his rookie season. Using ESPN standard scoring, he has produced at least 15 fantasy points in every game and been over 20 for the past two weeks. Cue a Giants defense with no pass rush for week 9 and a big day should be the result. Winston is no Drew Brees, so 7 touchdown passes should be out of the question. He has enough weapons that he should be able to muster at least another 20 points and that is better than the majority of quarterback options. 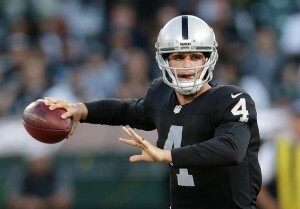 Carr is a great weekly option, let's bring up that ownership percentage. If you tell me that you saw the assault on the Jets defense coming last week, you’re either lying or a Raiders fan. Carr and the Raiders annihilated one of the better defenses in the league, making it look easy all day. Between Amari Cooper and Michael Crabtree, Carr has two premier targets to throw to each week. In week 9 he gets to face a Pittsburgh defense that has been very beatable and more big numbers should be on the way for the silver and black. Carr should be owned everywhere already, but his ownership is surprisingly low; go change that. I know that the Titans have a nice matchup this week, facing off against the Saints. The Titans have been remarkably unable to capitalize on matchups and this week should be no exception. The Saints defense will have something to prove after the Giants marched up and down the field against them. I think that this (like most weeks) is a big letdown game for the Titans offense. Although this has the feel of chasing points, Tamme should be solid in several more games this season. He has put up double digit points in two of the last four weeks and Atlanta faces an awful 49ers team in week 9. Most likely Devonta Freeman is going to get the lion’s share of fantasy points as the Falcons will be running out the clock for most of the game, but Tamme should see some red-zone looks. Matt Ryan trusts Tamme and the relationship appears to still be developing. For a streaming tight end, Jacob Tamme is a solid choice. You read that right, Vernon Davis was traded to the Broncos. Although playing with Peyton Manning is not what it once was, it is still a big step up from Colin Kaepernick. It should take Davis a week or two to get acclimated to his new team, but ROS he is a lower end TE1. Look for Peyton Manning to lean on Davis down the stretch as Manning lacks the arm strength to sling the deep ball the way he used to. Miller became invisible with Michael Vick and Landry Jones running the show, but now Big Ben is back at the helm. Roethlisberger was rusty in his comeback game, but he threw to Miller early and often. Heath should be a safe TE for the remainder of the season, so long as Roethlisberger stays healthy.